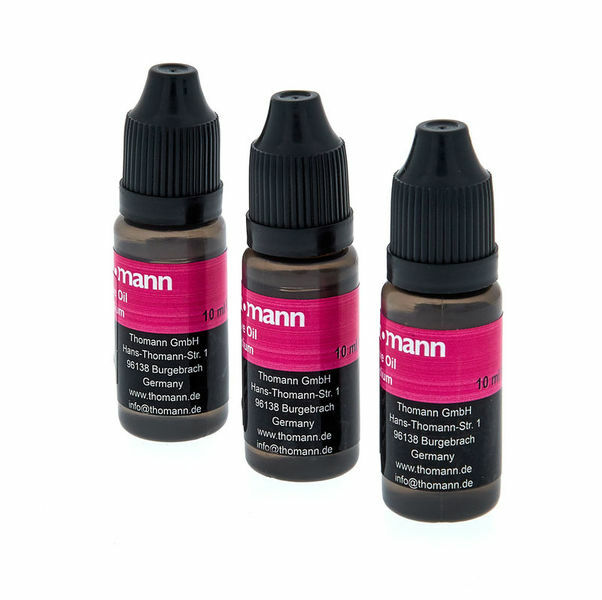 Here's the Medium valve oil, from the leading German company Thomann, who've been researching an outstanding range of oils for the last several years. These brand new oils are quite outstanding, the result of years of testing and yet more testing. The smoothest action you will find on the market at the moment. No residues, odourless, and it doesn't 'disappear' quickly. The 'pro's choice, without a doubt. It comes supplied with 3 small bottles (10ml each) so you can keep one in your case, one in your practice room and one spare. Sure to establish itself as the market leader in the year to come. Outstanding value and performance. Use the Medium valve oil for new and slightly older instruments, those with small and normal tolerances to get the ultimate performance, speed, smoothness, from your valve group. Probably the most popular oil in this range!